Our quest is taking us back west to visit family during the holiday season and for the Gladiator’s 2nd birthday. One of our few “one nighters” took us to Fairview-Riverside State Park in Lew-zee-anna, north shore of Lake Pontchartrain. This was a nice, scenic small little park on the river. And it is here that we finally took notice of our lovely government scams when it comes to fees for park usage. Here, they advertised $18 nightly fees, but even though we did not reserve anything on line (we just popped in) they still charged us an additional $6 for “administration fees”. Home sweet home in Fairview-Riverside St Pk. Swamp trees growing out of the river at Fairview. One of the neighboring “hovels” at Fairview. Somebody mentioned it may belong to a Country Western music husband and wife team. The next morning we headed into Natchez State Park in Mississippi for a few nights. The sites here were OK, the park had its own fishing lake, and we were only about 10 miles from Natchez. We tried to drive about a 60 mile stretch of the Natchez Trace (over 440-some miles of historical scenery from Natchez to Tennessee), but thanks to our pals Barrack, Harry, and John some of the sites on the Trace were closed/barracaded due to our elected officials not performing their required duties in Washington. We did make it into Natchez and took in the sights at some of the magnificent antebellum homes still standing. We took the tour of the Stanton Hall (www.stantonhall.com) and ate at the Carriage House restaurant there. Good southern fried chicken with an awesome side of lima beans. The Stanton House in Natchez. The “Sunken Trace” feature at Natchez Trace, formed by heavy foot traffic in the wild wild west days. Livingston, TX was our next stop for a stay at the Rainbow’s End SKP HQ. To get there from Natchez was interesting. We rely (good or bad) heavily on Agnes (the lady who is not my wife but yells at me inside my truck – GPS voice from navigation system) to get us on the right roads. For this trip out of Natchez she had us ultimately on LA Hwy. 8 near the Texas border. With the truck on auto-pilot we barreled down the 2 lane highway and luckily I was paying attention. I caught a caution sign as we passed it warning of a 12 foot-something clearance bridge one mile ahead. My estimated clearance for the 5er is a little over 13’, so my quick, calculus trained mind did the math and guestimated that my clearance was not small enough to match the bridge’s clearance. And yet again, luckily I was paying attention in calculus class way back when…The only problem was it was a VERY rural 2 lane highway with nothing but driveways to houses off of it. Thankfully we found a dirt driveway that I could pull in far enough to be able to back out of again onto the road and head in the opposite direction. I really did not want to be the only owner of a convertible fifth wheel trailer in the annals of RV history. We made it into Livingston with only about a half hour detour delay. The SKP headquarters contains the Care facility for RV-ers needing assisted care (they park their RV on sites designated for the Care Center) and the very large mail processing center for Escapee members. They are so large that this center has its own zip code. As far as Escapee/Rainbow parks go, I was not wowed by this one, but the Care facility and mail centers are impressive. Our home at Tyler State Park. A shot of the lake at Tyler State Park. The old Dallas School Book Depository, today. The 6th floor window, far right side, as it looks today. Looking at the Depository from the point of the fatal shot. OK, what visit to Dallas would be complete without a stop off at the Southfork Ranch, location for the TV soap “Dallas”. 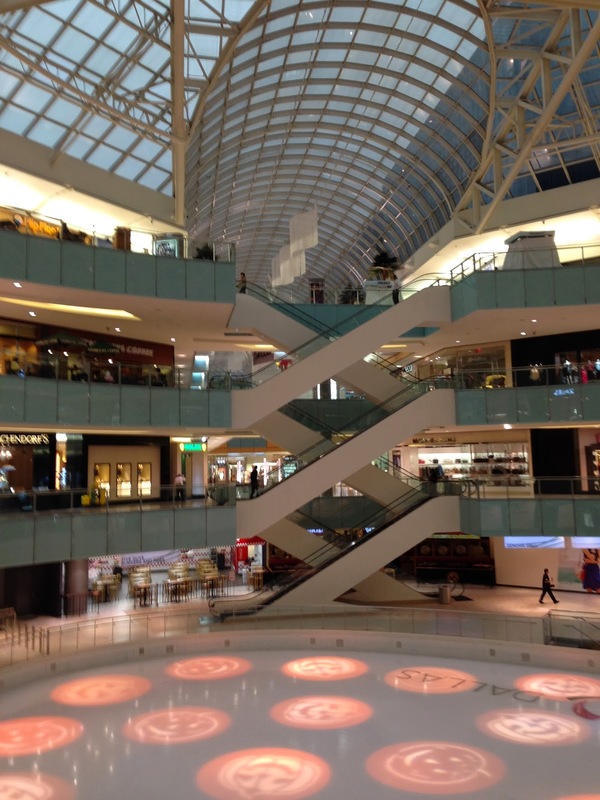 Since we were downtown Dallas, we just HAD to check out the Galleria shopping mall. It was very large (4 stories) but sorry, for me they all look alike any more. Inside the Galleria in Dallas, TX. 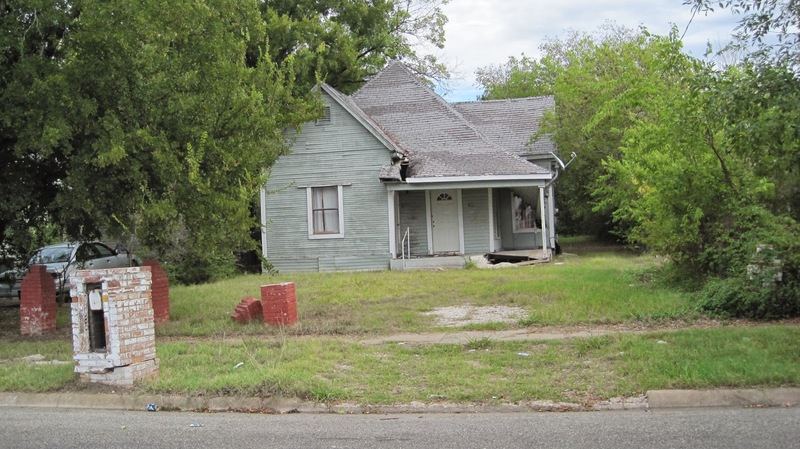 My father was born and/or raised in Sherman Texas, so I wanted to go see the town, possibly see the old family digs. Eisenhower State Park was our next stop, between Denison and Sherman. A run into Sherman and we found the town kind of half modern and half “Back-to-the Future”-esque. We found the visitor’s center inside the old Antique store. I did not have any information about my family history or residences, and one of the gents there gave us a copy of the 1947 city directory which listed my paternal grandparents address, as well as my grandfather’s employer. Unfortunately we found the family home replaced by a city recreational park with sports fields. The bright spot was the building that my grandfather worked in was still standing. One of my dad’s neighbors off Ross Rd. in Sherman, TX. Dear ol’ Grandad’s place of business in the 1940’s, as it looks today. Beautiful, bustling, downtown Sherman TX!?!? My dad’s old high school building still stands today. On we went, to Lake Arrowhead State Park in Witchita Falls, TX. This area is having a rough go as far as drought conditions, the lake is terrible low, boat ramp docks piled up in the parking area, fishing pier good for fishing for dirt clods (no water under it). We ducked into Witchita Falls to check it out, the big attraction being the Falls at Lucy Park. We were unimpressed, hard to believe this big ol’ city is namesaked after these small waterfalls that aren’t even in their natural state (they were originally about 4 feet tall, but got a facelift with the help of a lot of concrete to be what they are today. I’ll tell you now, so far as what we have seen Tennessee has the absolute BEST waterfalls. 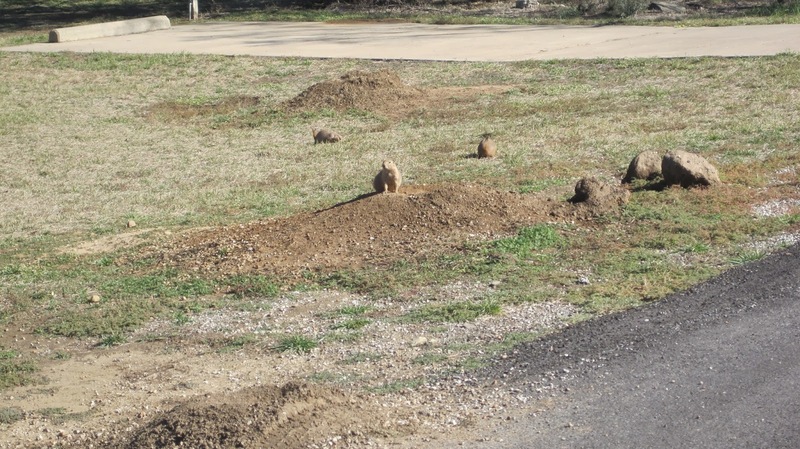 Prairie Dog Town at Lake Arrowhead St. Pk. We had a whole flock of walking sticks covering the trailer at Lake Arrowhead. They really liked the rubber tires. While in town, Jeanne has been on a quest to find a GOOD Mexican restaurant in Texas, she was told by someone that she JUST HAD to try one. We were aimed to Alfredo’s Mexican Cafe by the visitor center clerk. We went. We ate. I am now convinced. The absolute only good, authentic, Mexican food is served within the boundaries of the state of California, unless of course you travel south of the border. Any attempt to seek out a good Mexican restaurant anywhere but California is a wasted effort. 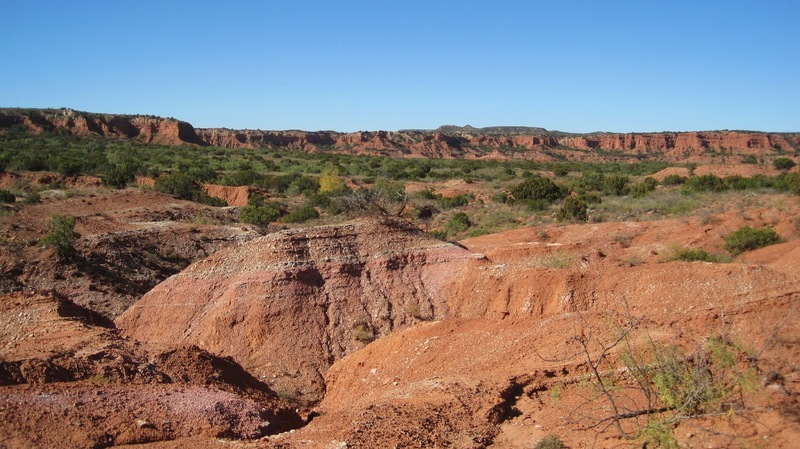 Panorama of Caprock Canyons St. Pk. Scenery along one of the hiking trails. Jeanne the Spelunking Queen under the Natural Bridge. There is a large herd of these critters inside the park. This guy would look good on my BBQ. Yikes! Centipede! He was about 8″ long and FAST!